Blog / General Gardening / Seasonal Chores / Heads up! Keep your eyes open for winter plant damage. Heads up! Keep your eyes open for winter plant damage. As you make your early garden rounds this spring, keep in mind that our plants, particularly the woody ones, have experienced two very atypical growing seasons. First, a long, moist summer that produced copious amounts of large needles and leaves, along with a bountiful harvest of cones, nuts and fruits. That was followed by an on-again, off-again fall that ended in February with several icy, deep freezes. Although sap does contain an “antifreeze,” many plants weren’t prepared. Expect to see some damage as a result, along with potential harm from salt. 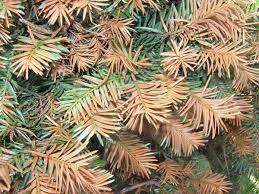 Evergreens will show the results of desiccation, much like a drought: brown tips and edges, particularly on the windward side. Sub-lethal damage may also cause pigments to change. Green leaves become yellowish, reddish, or purple. Not good, but Mother Nature can handle it. A later freeze can be even worse. Trees, like peaches, or even some apples, will have met their chilling requirement and decided that spring has arrived. They put out buds and then, suddenly, the buds are lost. 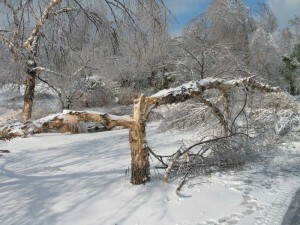 Ice or snow load may have broken branches. Prune them back until there’s a side branch positioned in your preferred direction. Keep your eyes open for later adventitious buds and sprouts from the damaged branch. Remove all of those that don’t contribute to the shape you’re seeking. If you let them grow, they’ll create a tangled mess in the future. With your herbaceous plants—those perennial flowers—hopefully they were mulched heavily enough to be insulated from temperature swings. If they’re “hardy”, once frozen, they’ve stayed frozen. 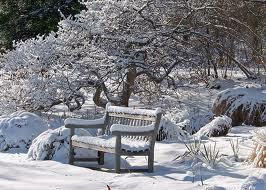 It’s the chronic freezing/thawing that creates issues. Keep in mind that different species, or different varieties of the same species, may react differently. A good example is the Japanese maple. Also, location can create micro climates: north side of a house can be quite different from southern exposure..
One last note: A deformity may not show up until after several years of growth. You might add a “heads-up” note to your garden journal’s spring pages as a reminder. P.S. All of that vegetative growth has now dried and is ripe for combustion. Put a high priority on getting that cleaned up. Pay particular attention to the spaces under wooden decks, porches and stairways where it could serve as kindling for a house fire.